Now that this is a regular feature here at MinerBumping, we need a theme song or jingle or something. 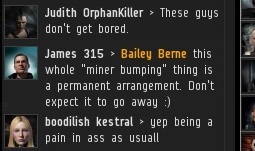 "Highsec miner, mining for years. Reach in the Grab Bag and pull out some tears!" Or whatever, we're still working on it. After all the misinformation about orbiting, it's nice to see someone who tells the others it doesn't actually work. Progress. The whole "he'll get bored and stop bumping eventually" meme is just about extinct. 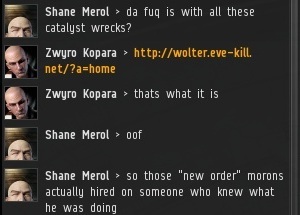 The New Order of Highsec is not some fly-by-night operation. We've put down serious roots in the community. 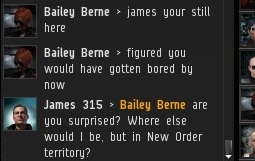 What's Bailey Berne's status, a friend or foe? I'll assume "friend" and call it a day. One distraught miner just throws up his hands and asks "why?" FYI my Manifestos on the subject can be accessed via the Links page. 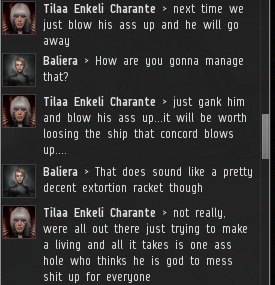 Grotesque insults are the product of the "old" highsec. 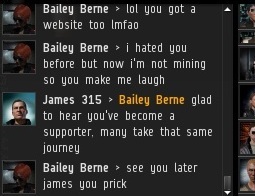 Miners with anxiety about the change we bring shouldn't get too nostalgic. 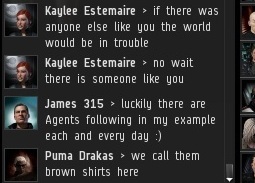 If someone is taking any kind of action against rebellious miners, it's done in the name of the New Order, or may as well be. 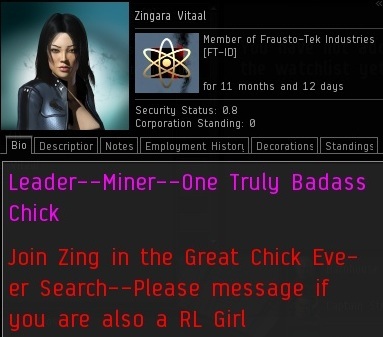 Ice miner Zingara Vitaal is a member of Frausto-Tek Industries, a corporation that got trounced in a war against my corp and also lost nearly 2 billion isk worth of ships to Agent Angel Violette. On the other hand, her bio says she's a "badass", so I'm sure she won't embarrass herself like all those sissy miners. 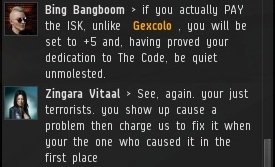 Zingara offers an interesting definition of the word "terrorist": People who charge you to fix the problems they caused. Or maybe she didn't actually mean "terrorist". 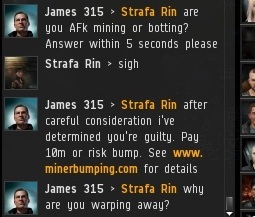 Why does bumping miners imply I think I'm a "god"? It's weird, but perhaps an intriguing insight into the way miners view power dynamics, or seek to assert control over their lives through performing a routine, risk-free activity. I prefer it to the usual Godwin's Law nonsense we usually see. Zingara's definition of terrorists ("Show up, cause a problem and then charge us to fix it when you're the one who caused it in the first place.") sound surprisingly much like my ISP. They create problems, then charge me to fix it. Can't blame them for not trying to earn money, though. And unlike my ISP, the New Order actually "fixes the problem" within a reasonable amount of time.